Cabrillo National Monument, Point Loma, California, USA. Middle and low zone in pools; subtidal.. 07 Sep 2018. © National Park Service U.S. Department of the Interior. subtidal, Ría de Ferrol, Galicia, Spain, 2015. Ignacio Bárbara. © Ignacio Bárbara (barbara@udc.es). subtidal with Zostera marina, Ría de Aldán, Galicia, Spain, 2015. Ignacio Bárbara. © Ignacio Bárbara (barbara@udc.es). 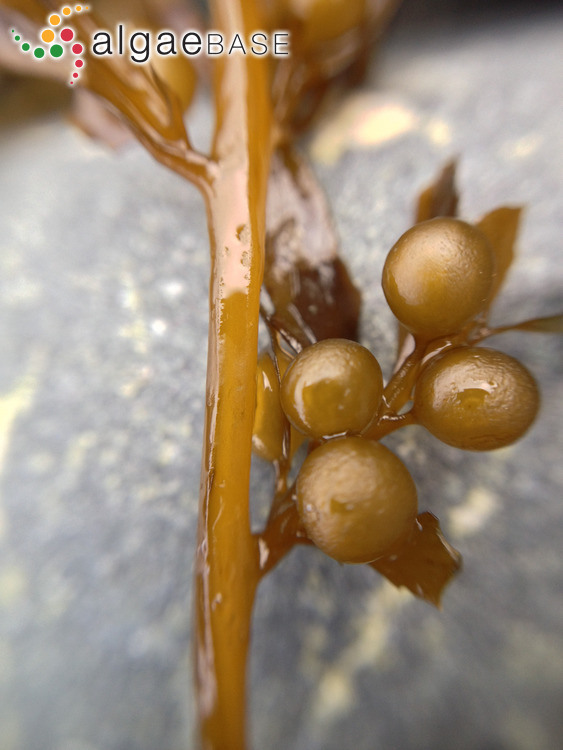 Close-up of floats on Sargassum muticum, an invasive seaweed on Vancouver Island, B.C.. 24 Oct 2014. Bridgette Clarkston. © 2014 Bridgette Clarkston. Sargassum muticum, RÃ­a de Ferrol, Galicia, Spain, 2013, Ignacio BÃ¡rbara" . Ignacio Bárbara. © Ignacio Bárbara (barbara@udc.es). Sargassum muticum, North of Portugal, Spain, 2013, Ignacio BÃ¡rbara. Ignacio Bárbara. © Ignacio Bárbara (barbara@udc.es). Sargassum muticum, RÃ­a de A CoruÃ±a, Galicia, Spain, 2013, Ignacio BÃ¡rbara. Ignacio Bárbara. © Ignacio Bárbara (barbara@udc.es). Type locality: Izumo, Prov. Kii, Honshu, Japan (Yoshida 1978: 122). Lectotype: April 1902; TI (Yoshida 1978: 122, 123). Adjective (Latin), without a point, awnless, blunt (Stearn 1973). Originally known only from Japan, this species was first found in British Columbia in 1944 and in Oregon in 1947. It first appeared in northern California in 1963 (Crescent City), southern California in 1970 (Santa Catalina Island), and in San Francisco Bay in 1973 (Berkeley). Also in 1973, it was found for the first time in the north Atlantic at Bembridge, Isle of Wight, on the south coast of England (Farnham, Fletcher & Irvine, 1973), as predicted by Dreuhl (1972). The species is now widely distributed from Norway to Spain. It now occurs throughout the north Pacific, north Atlantic and Mediterranean showing an extraordinary ability to tolerate a wide range of conditions and is regarded as highly invasive (Norton, 1976). Silva (1979: 338) observes preceptively: "It is a weed in the sociological sense of a plant growing outside its original range and in such a manner as to be unwanted." A single plant was found in O'ahu, Hawai'i attached to the hull of a barge that had been towed from San Diego in California, but the species does not seem to have established itself in Hawai'i (Abbott & Huisman, 2004). Critchley et al. (1990) gives a comprehensive account of the spread of this entity up to 1990. See also Verlaque et al. (2015: 95) who regard this species as a "pest and fouling organism" in the Mediterranean, where it first appeared in the Etang de Thau, France, in 1980. English: Wireweed (Mondragon & Mondragon 2003). Europe: Adriatic Sea (Curiel et al.1998), Atlantic France (Burel, Le Duff & Ar Gall 2019), Balearic Islands (Rull Lluch et al. 1994), Baltic Sea (Nielsen et al. 1995, Kontula & Fürhapter 2012), Britain (Hardy & Guiry 2003, Brodie et al. 2016, Bunker et al. 2017), France (Ben Maiz, Boudouresque, Lauret & Riouall 1988, Ribera et al. 1992, Coppejans & Kling 1995, Verlaque 2001, Connan et al 2006, Dizerbo & Herpe 2007, Silberfeld et al. 2011, Anon. 2017), France (Breizh) (Loiseaux-de Goër & Noailles 2008), Germany (Ludwig & Schnittler 1996), Helgoland (Bartsch & Kuhlenkamp 2000), Ireland (Boaden 1995, Stokes, O'Neill & McDonald 2004, Strong & Dring 2011, Guiry 2012, Bunker et al. 2017), Italy (Furnari, Cormaci & Serio 1999), Netherlands (Stegenga & Mol 1983, Stegenga et al. 1997, Draisma, Prud'homme van Reine, Stam & Olsen 2001, Stegenga, Kaaremans & Simons 2007, Gittenberger et al. 2010 , Veen et al. 2015), Norway (Rueness 1997, Brattegard & Holte 2001), Portugal (Rull Lluch et al. 1994, Ribera et al. 1996, Araújo et al., 2003, Valera-Alvarez et al 2006, Araújo et al. 2006, Engelen et al. 2008, Araújo et al. 2009, Vaz-Pinto et al. 2014), Scandinavia (Athanasiadis 1996, Karlason et al. 2018), Spain (Casares Pascual et al. 1987, Pérez-Cirera, Cremades & Bárbara 1989, Fernández, Gutiérrez & Rico 1990, Granja, Cremades & Barbara 1992, Rull Lluch et al. 1994, Bárbara, Cremades & Pérez-Cirera 1995, Cremades Ugarte, J. (1995), Bárbara & Cremades 1996, Ribera et al. 1996, Cremades, Bárbara, Granja & Veiga 1997, Veiga, Cremades & Bárbara 1998, Arenas & Fernandéz 1998, Fernández 1999, Peña & Bárbara 2002, Sánchez, Fernández & Rico 2003, Gorostiaga et al., 2004, Bárbara et al. 2005, Diaz-Tapia & Bárbara 2005, Sánchez & Fernández 2005, Sánchez et al 2005, Peña & Bárbara 2006, Martínez-Gil et al. 2007, Viejo et al. 2008, Peña & Bárbara 2008, Peña & Bárbara 2010, Cires Rodriguez & Cuesta Moliner 2010, Incera et al. 2011, Bermejo et al. 2012), Spain (incl. Canary Is.) (Gallardo et al. 2016), Veneto (Sfriso 2011). North America: Alaska (AK) (Lindstrom 1977, Scagel et al. 1989, Lindeberg & Lindstrom 2010), Baja California N (Pacific) (Riosmena-Rodriguez et al. 2012), Baja California Sur (Pacific) (Riosmena-Rodriguez et al. 2012), British Columbia (Scagel et al. 1989, Phillips 1995), California (CA) (Abbott & Hollenberg 1976, Silva 1979, Scagel et al. 1989, Stewart 1991, Phillips 1995, Miller 2012, Augyte & Shaughnessy 2014 ), Mexico (Phillips 1995, Castaneda-Fernández de Lara et al. 2010 ), Oregon (OR) (Hansen 1997), Washington (WA) (Scagel et al. 1989, Phillips 1995, Mondragon & Mondragon 2003, Galloway et al. 2012). Central America: Mexico (Pacific) (Pedroche et al. 2008 ). Africa: Morocco (Sabour et al. ). Asia: China (Tseng, Yoshida & Chiang 1985, Phillips 1995, Liu 2008, Tseng 2009), Japan (Tseng, Yoshida & Chiang 1985, Yoshida, Nakajima & Nakata 1990, Phillips 1995, Yoshida 1998, Stiger et al. 2004, Riosmena-Rodriguez et al. 2012, Yoshida, Suzuki & Yoshinaga 2015), Korea (Lee & Yoo 1992, Phillips 1995, Lee & Kang 2001, Cho et al. 2006, Lee 2008, Oak 2010, Lee et al. 2011), South Korea (Riosmena-Rodriguez et al. 2012, Cho et al. 2012). Pacific Islands: Hawaiian Islands (HI) (Abbott & Huisman, 2004). Farnham, W.F., Fletcher, R.L. & Irvine, L.M. (1973). Attached Sargassum found in Britain. Nature, London 243: 231-232. Accesses: This record has been accessed by users 129673 times since it was created. Andrew, N.L. & Viejo, R.M. (1998). Ecological limits to the invasion of Sargassum muticum in northern Spain. Aquatic Botany 60: 251-263. Andrew, N.L. & Viejo, R.M. (1998). Effects of wave exposure and intraspecific density on the growth and survivorship of Sargassum muticum (Sargassaceae: Phaeophyta). European Journal of Phycology 33: 251-258, 5 figs, 4 tables. Arenas, F. & Fernandéz, C. (1998). Ecology of Sargassum muticum (Phaeophyta) on the north coast of Spain III. Reproductive ecology. Botanica Marina 41: 209-216, 8 figs. Arenas, F. & Fernández, C. (2000). Size structure and dynamics is a population of Sargassum muticum (Phaeophyceae). Journal of Phycology 36: 1012-1020. Arenas, F., Fernández, C., Rico, J.M., Fernández, E. & Haya, D. (1995). Growth and reproductive strategies of Sargassum muticum (Yendo) Fensholt and Cystoseira nodicaulis (Whit.) Roberts. Sci. Mar. 59 (supl. ): 1-8. Balboa, E.M., Gallego-Fábrega, C., Moure, A. & Domínguez, H. (2016). Study of the seasonal variation on proximate composition of oven-dried Sargassum muticum biomass collected in Vigo Ria, Spain. J. Appl. Phycol. 28: 1943-1953. Belattmania, Z., Chaouti, A., Reani, A., Machado, M., Engelen, A.H., Serrão, E.A. & Sabour, B. (2018). Similar epiphytic macrofauna inhabiting the introduced Sargassum muticum and native fucoids on the Atlantic coast of Morocco. Cryptogamie Algologie 39(3): 269-292. Belsher, T. & Pommellec, S. (1988). Expansion de l'algue d'origine japonaise Sargassum muticum (Yendo) Fensholt, sur les côtes Français, de 1983 à 1987. Cahiers de Biologie Marine 29: 221-231. Belsher, T. (1983-1989). Sargassum muticum (Yendo) Fensholt sur le littoral Français. Direction de l'Environment et de l'Aménagement Littoral : 1-99. Boaden, P.J.S. (1995). The adventive seaweed Sargassum muticum (Yendo) Fensholt in Strangford Lough, Northern Ireland. Irish Naturalists' Journal 25: 111-113. Boalch, G.T. & Potts, G.W. (1977). The first occurrence of Sargassum muticum (Yendo) Fensholt in the Plymouth area. Journal of the Marine Biological Association of the United Kingdom 57: 29-31. Cabioch, J. (1981). Premières observations de l'algue Japonaise Sargassum muticum (Yendo) Fensholt dans la région de Roscoff. Travaux Station Biologique de Roscoff, Nouvelle Série 27: 1-2. Casares Pascual, C., Gómez Garreta, A., Ribera Siguán, M.A. & Seoane-Camba, J.A. (1987). Sargassum muticum (Yendo) Fensholt, nueva cita para la Península Ibérica. Collectanea Botanica (Barcelona) 17(1): 151-156. Casas, M.P., Rodríguez-Hermida, V., Pérez-Larrán, P., Conde, E., Turco Liberi, M., Ribeiro, D., Fernandes, E. & Domínguez, H. (2016). In vitro bioactive properties of phlorotannins recovered from hydrothermal treatment of Sargassum muticum. Separation and purification technology 167: 117-126. Chamberlain, A.H.L. (1978). Preliminary observations of apical dominance effects in Sargassum muticum (Yendo) Fensholt. British Phycological Journal 13: 198. Cheang, C.C., Chu, K.H., Fujita, D., Yoshida, G., Hiraoka, M., Critchley, A., Choi, H.G. Duan, D., Serisawa, Y. & Ang, P.O., Jr (2010). Low genetic variability of Sargassum muticum (Phaeophyceae) revealed by a global analysis of native and introduced populations. Journal of Phycology 46(6): 1063-1074. Coppejans, E., Rappe, G., Podoor, N. & Asperges, M. (1980). Sargassum muticum (Yendo) Fensholt ook langs de Belgische kust Aangespoeld. Dumortiera 16: 7-13. Cosson, J., Duglet, A. & Billard, C. (1977). Sur la vegetation algale de l'etage littoral dans la region de Saint-Vaast-la-Houge et la presence d'une espèce nouvelle pour les côtes françaises: Sargassum muticum (Yendo) Fensholt (Pheophycée, Fucale). Bulletin de la Société Linnéenne de Normandie 105: 109-116. Critchley, A. (1981). Age determination of Sargassum muticum (Yendo) Fensholt. British Phycological Journal 16: 134. Critchley, A. T., Nienhuis, P. H. & Verschuure, K. (1987). Presence and development of populations of the introduced brown alga Sargassum muticum in the southwest Netherlands. Proceedings of the International Seaweed Symposium 12: 245-255. Critchley, A.T. & Dijkema, R. (1984). On the presence of the introduced brown alga Sargassum muticum, attached to commercially imported Ostrea edulis in the S. W. Netherlands. Botanica Marina 27: 211-216. Critchley, A.T. (1980). The further spread of Sargassum muticum. British Phycological Journal 15: 194. Critchley, A.T. (1983). Sargassum muticum: a morphological study of European material. Journal of the Marine Biological Association of the United Kingdom 63: 813-824. Critchley, A.T. (1983). Sargassum muticum: a taxonomic history including world-wide and western Pacific distributions. Journal of the Marine Biological Association of the United Kingdom 63: 617-625. Critchley, A.T. (1983). Experimental observations on variability of leaf and air vesicle shape of Sargassum muticum. Journal of the Marine Biological Association of the United Kingdom 63: 825-831. Critchley, A.T. (1983). The establishment and increase of Sargassum muticum (Yendo) Fensholt populations within the Solent area of southern Britain. I. An investigation of the increase in number of population individuals. Botanica Marina 26: 539-545. Critchley, A.T. (1983). The establishment and increase of Sargassum muticum (Yendo) Fensholt populations within the Solent area of southern Britain. II. An investigation of the increase in canopy cover of the alga at low water. Botanica Marina 26: 547-552. Critchley, A.T., Farnham, W.F. & Morrell, S.L. (1983). 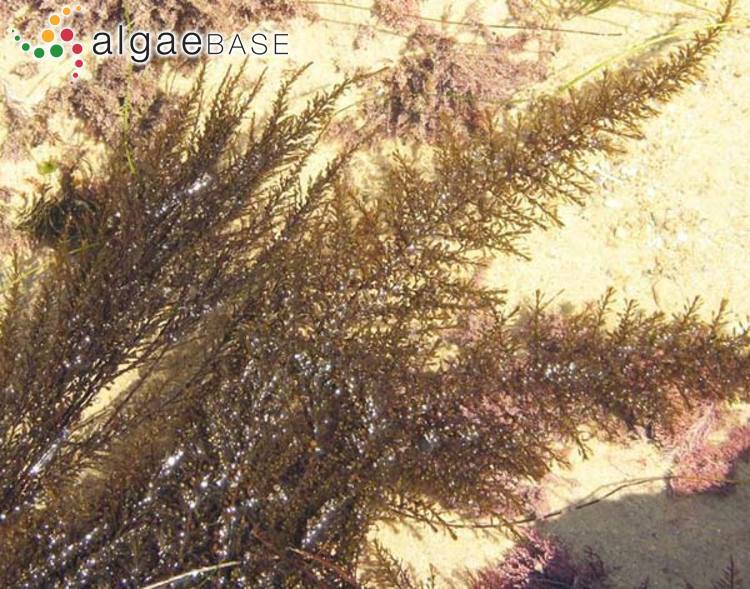 A chronology of new European sites of attachment for the invasive brown alga, Sargassum muticum, 1973-1981. Journal of the Marine Biological Association of the United Kingdom 63: 799-811. Critchley, A.T., Farnham, W.F. & Morrell, S.L. (1986). 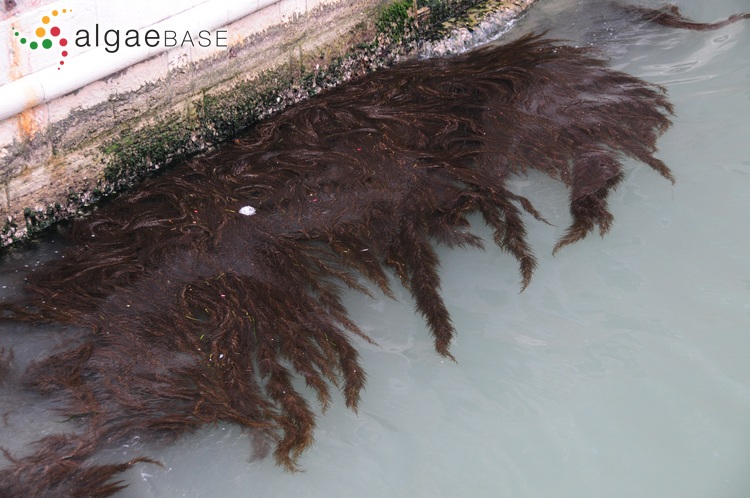 An account of the attempted control of an introduced marine alga, Sargassum muticum, in southern England. Biological Conservation 35: 313-332.
de Paula, É.J. & Eston, V.R. (1987). Are there other Sargassum species potentially as invasive as S. muticum?. Botanica Marina 30: 405-410. De Wreede, R.E. & Vandermeulen, H. (1988). Lithothrix aspergillum (Rhodophyta): regrowth and interaction with Sargassum muticum (Phaeophyta) and Neorhodomela larix (Rhodophyta). Phycologia 27: 469-476. De Wreede, R.E. (1978). Phenology of Sargassum muticum (Phaeophyta) in the Strait of Georgia, British Columbia. Syesis 11: 1-9. Deysher, L. E. (1984). 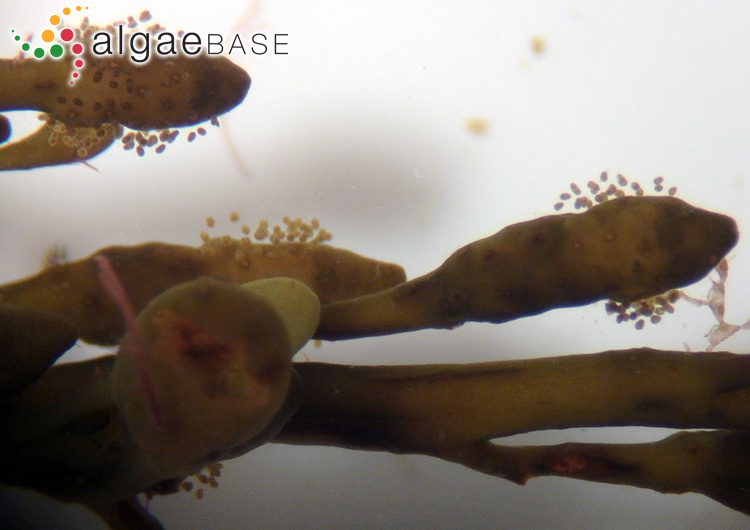 Reproductive phenology of newly introduced populations of the brown alga, Sargassum muticum (Yendo) Fensholt. Proceedings of the International Seaweed Symposium 11: 403-407. Engelen, A.H., Espirito-Santo, C., Simões, T., Monteiro, C., Serrão E.A., Pearson, G.A. & Santos, R.O. P. (2008). Periodicity of propagule expulsion and settlement in the competing native and invasive brown seaweeds, Cystoseira humilis and Sargassum muticum (Phaeophyta). European Journal of Phycology 43(3): 275-282. Engelen, A.H., Henriques, N., Monteiro, C. & Santos, R. (2011). 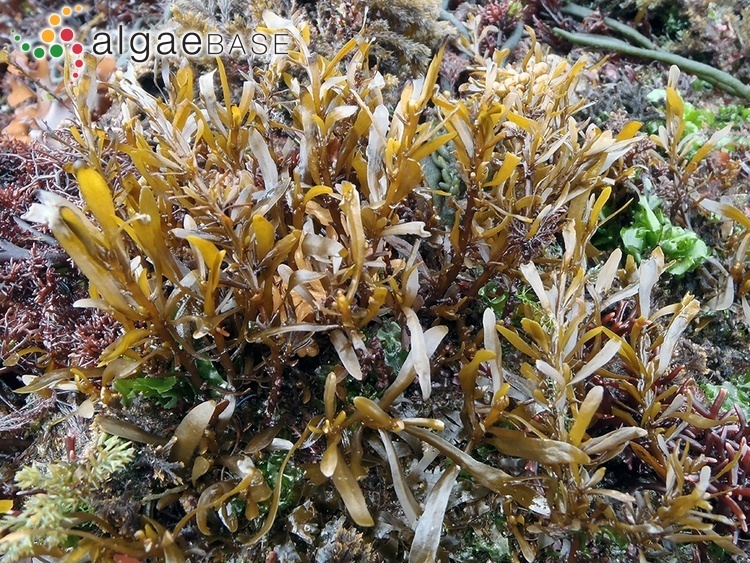 Mesograzers prefer mostly native seaweeds over the invasive brown seaweed Sargassum muticum. Hydrobiologia 669: 157-165. Farnham, W., Murfin, C., Critchley, A. & Morell, S. (1981). 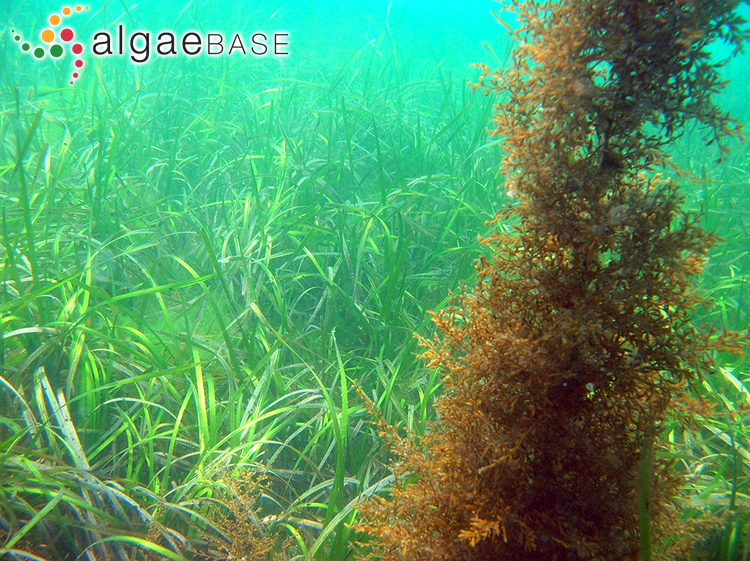 Distribution and control of the brown alga Sargassum muticum. Proceedings of the International Seaweed Symposium 10: 277-282. Farnham, W.F. & Jones, E.B.G. (1974). The eradication of the seaweed Sargassum muticum from Britain. Biological Conservation 6: . Fernández, C. (1999). Ecology of Sargassum muticum (Phaeophyta) on the north coast of Spain: IV. Sequence of colonization on a shore. Botanica Marina 42: 553-562, 9 figs, 6 tables. Fernández, C., Gutiérrez, L.M. & Rico, J.M. (1990). Ecology of Sargassum muticum on the north coast of Spain. Preliminary observations. Botanica Marina 33: 423-428. Fernández, C., Gutiérrez, M. & Rico, J.M. (1990). Ecology of Sargassum muticum on the North Coast of Spain. Preliminary observations. Botanica Marina 33: 423-428. Fisher, D.D. & Gibor, A. (1987). 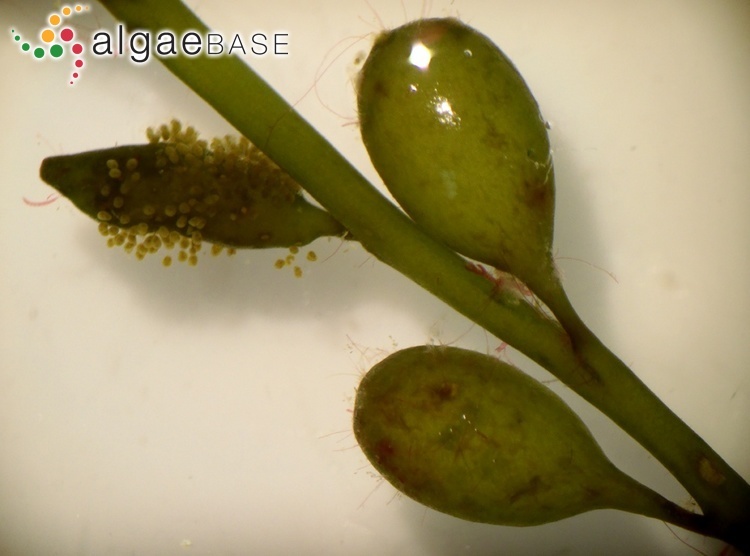 Production of protoplasts from the brown alga, Sargassum muticum (Yendo) Fensholt (Phaeophyta). Phycologia 26: 488-495. Fletcher, R.L. (1975). Studies on the recently introduced brown alga Sargassum muticum (Yendo) Fensholt II. Regenerative ability. Botanica Marina 18: 157-162. Fletcher, R.L. (1975). Studies on the recently introduced brown alga Sargassum muticum (Yendo) Fensholt I. Ecology and reproduction. Botanica Marina 18: 149-156. Fletcher, R.L. (1980). Studies on the recently introduced brown alga Sargassum muticum (Yendo) Fensholt III. Periodicity in gamete release and 'incubation' of early germling stages. Botanica Marina 23: 425-432. Flores-Fernández, N., López-García, M., González-Muñoz, M.J., López-Vilariño, J.M. & Domínguez, H. (2017). Ultrasound-assisted extraction of fucoidan from Sargassum muticum. J. Appl. Phycol. 29: 1553-1561. Gerbal, M., Maiz, N.B. & Boudouresque, C.-F. (1985). Les peuplements à Sargassum muticum de l'Étang de Thau: données préliminaires sur la flore algale. Actes Cong. Nat. Soc. Sav. 110: 241-254. Givernaud, T., Cosson, J. & Givernaudmouradi, A. (1990). 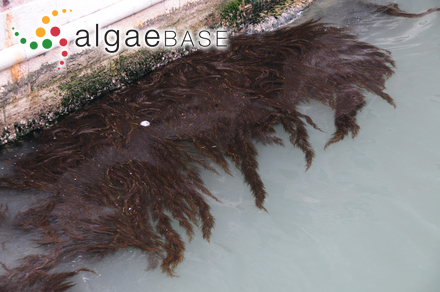 Regeneration of the brown seaweed Sargassum muticum (Phaeophyceae, Fucale). Cryptogamie, Algologie 11(4): 293-304. González-López, N., Moure, A. & Domínguez, H. (2012). Hydrothermal fractionation of Sargassum muticum biomass. J. Appl. Phycol. 24: 1569-1578. Gorostiaga, J.M., Casares, C., Fernandez, J.A., Perez, B. & Sarasua, A. (1988). Sobre la Expansion de Sargassum muticum (Yendo) Fensholt en la costa Atlantica Europea. Lurralde 11: 437-443. Gray, P.W.G. & Gareth Jones, E.B. (1977). The attempted clearance of Sargassum muticum from Britain. Environmental Conservation 4: 303-308. Hales, J.M. & Fletcher, R.E. (1992). Receptacle regeneration in Sargassum muticum (Phaeophyta). Phycologia 31: 591-601, 25 figs, 1 table. Hales, J.M. & Fletcher, R.L. (1983). Observations on tissue regeneration in wounded receptacles of Sargassum muticum. British Phycological Journal 18: 204. Hales, J.M. & Fletcher, R.L. (1989). Studies on the recently introduced brown alga Sargassum muticum (Yendo) Fensholt. IV. The effect of temperature, irradiance and salinity on germling growth. Botanica Marina 32: 167-176. Hales, J.M. & Fletcher, R.L. (1990). Studies on the recently introduced brown alga Sargassum muticum (Yendo) Fensholt. 5. Receptacle initiation and growth, and gamete release in laboratory culture. Botanica Marina 33: 241-249. Hwang, E.K. & Dring, M.J. (2002). Quantitative photoperiodic control of erect thallus production in Sargassum muticum. Botanica Marina 45: 471-475. Incera, M., Olabarria, C., Cacabelos, E., César, J., & Troncoso, J.S. (2011). Distribution of Sargassum muticum on the North West coast of Spain. Relationships with urbanization and community diversity. Cont. Shelf. Res. 31: 488-495. Jephson, N.A. & Gray, P.W.G. (1977). Aspects of the ecology of Sargassum muticum (Yendo) Fensholt, in the Solent Region of the British Isles I. The growth cycle and epiphytes. Biology of Benthic Organisms : 367-375. Kane, D.F. (1978). Observations of the vegetative growth of Sargassum muticum in laboratory culture. British Phycological Journal 13: 202-203. Karlsson, J. & Loo, L.O. (1999). On the distribution and continuous expansion of the Japanese seaweed - Sargassum muticum - in Sweden. Botanica Marina 42: 285-295. Karlsson, J. (1988). Sargassum muticum, a new member of the algal flora of the Swedish West Coast. Svensk Botanisk Tidskrift 82: 199-205. Knoepffler-Peguy, M., Belsher, T., Boudouresque, C.-F. & Lauret, M. (1985). Sargassum muticum begins to invade the Mediterranean. Aquatic Botany 23: 291-295. Kraan, S. (2008). Sargassum muticum (Yendo) Fensholt in Ireland: an invasive species on the move. Journal of Applied Phycology 20: 825-832. Le Lann, K., Jégou, C. & Stiger-Pouvreau, V. (2008). 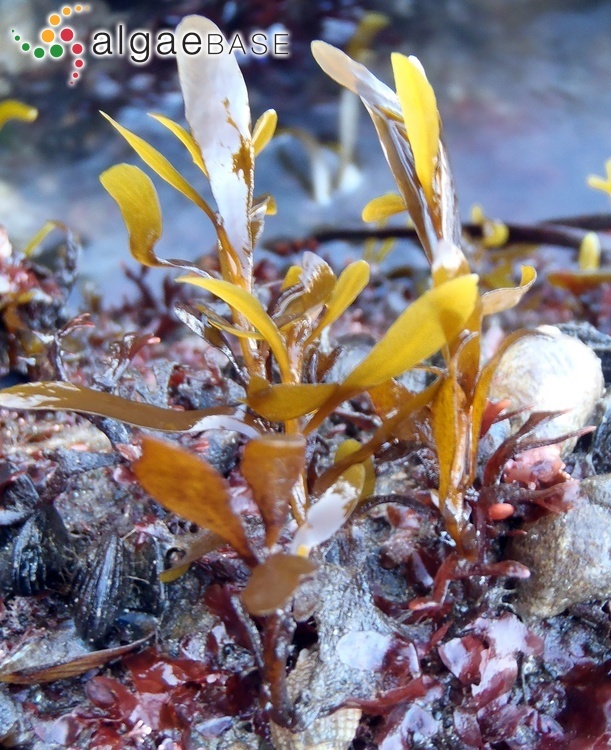 Effect of different conditioning treatments on total phenolic content and antioxidant activities in two Sargassacean species: Comparison of the frondose Sargassum muticum (Yendo) Fensholt and the cylindrical Bifurcaria bifurcata R. Ross. Phycological Research 56(4): 238-245. Lewey, S. & Farnham, W. F. (1981). Observations on Sargassum muticum in Britain. Proceedings of the International Seaweed Symposium 8: 388-394. Lewey, S.A. (1978). Variation in the pigment composition of Sargassum muticum. British Phycological Journal 13: 203. Loughnane, C. & Stengel, D.B. (2002). Attached Sargassum muticum (Yendo) Fensholt found on the west coast of Ireland. Irish Naturalists' Journal 27: 70-72. Monteiro, C., Engelen, A.H., Serrão, E.A. & Santos, R. (2009). Habitat differences in the timing of reproduction of the invasive alga Sargassum muticum (Phaeophyta, Sargassaceae) over tidal and lunar cycles. Journal of Phycology 45: 1-7. Montero, L., Sánchez-Camargo, A.P., García-Cañas, V. Tanniou, A., Stiger-Pouvreau, V., Russo, M., Rasatrelli, L., Cifuentes, A., Herrero, M. & Ibañez, E. (2016). Anti-proliferative activity and chemical characterization by comprehensive coupled to mass spectrometry of phlorotannins from the brown macroalga Sargassum muticum collected on North Atlantic coasts. J. Chromatography A 1428: 115-125. Morrell, S. & Farnham, W.F. (1981). The effects of mechanical clearance on Solent populations of Sargassum muticum. British Phycological Journal 16: 138. Morrell, S.L. & Farnham, W.F. (1982). Some effects of substratum on Sargassum muticum. British Phycological Journal 17: 236-237. Nicholson, N., Hosmer, H., Bird, K., Hart, L., Sandlin, W., Shoemaker, C. & Sloan, C. (1981). The biology of Sargassum muticum (Yendo) Fensholt at Santa Catalina Island, California. Proceedings of the International Seaweed Symposium 8: 416-424. Norton, T. A. (1981). Sargassum muticum on the Pacific coast of North America. Proceedings of the International Seaweed Symposium 8: 449-456. Norton, T.A. (1976). Why is Sargassum muticum so invasive?. British Phycolgical Journal 11: 197-198. Norton, T.A. (1980). Sink, swim or stick: the fate of Sargassum muticum propagules. British Phycological Journal 15: 197-198. Norton, T.A. (1981). 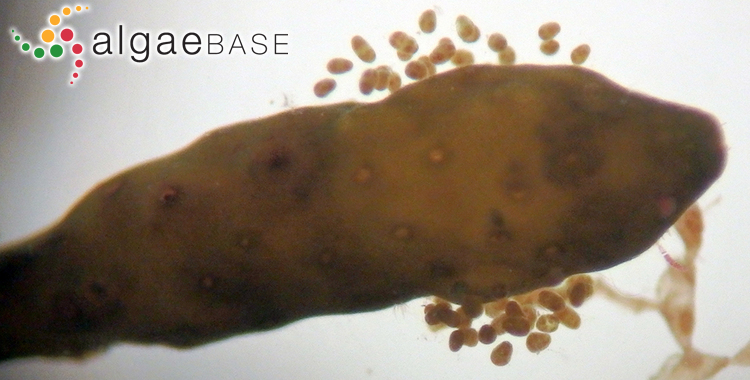 Gamete expulsion and release in Sargassum muticum. Botanica Marina 24: 465-470. Olabarría, C., Rodil, I.F., Incera, M. & Troncoso, J.S. (2009). Limited impact of Sargassum muticum on native algal assemblages from rocky intertidal shores. Marine Environmental Research 67: 153-158. Olabarría, C., Rossi, F., Rodil, I.F., Quintas, P. & Troncoso, J.S. (2009). Uso de diseños jerárquicos en la detección de escalas de heterogeneidad en la especie invasora Sargassum muticum. Scientia Marina 98: 194-197. Paula, E.J. & Eston, V.R. (1987). Are there other Sargassum species potentially as invasive as S. muticum ?. Botanica Marina 30: 405-410. Plouguerné, E., Georgantea, P., Ioannou, E., Vagias, C., Roussis, V., Hellio, C., Kraffe, E. & Stiger-Pouvreau, V. (2010). Anti-microfouling activity of lipidic metabolites from the invasive brown alga Sargassum muticum (Yendo) Fensholt. Marine Biotechnology 12(1): 52-61. Plouguerné, E., Le Lann, K., Connan, S., Jechoux, G., Deslandes, E. & Stiger-Pouvreau, V. (2006). Spatial and seasonal variations in density, maturity, length and phenolic content of the invasive brown macroalga Sargassum muticum along the coast of Western Brittany (France). Aquatic Botany 85: 377-344. Prud'homme van Reine, W.F. & Nienhuis, P.H. (1982). Occurrence of the brown alga Sargassum muticum (Yendo) Fensholt in The Netherlands. Botanica Marina 25: 37-39. Prud'Homme van Reine, W.F., van der Wiele, P. & Bom, H. (1982). Studies on Sargassum muticum in the Netherlands. British Phycological Journal 17: 238. Rico, J.M. & Fernández, C. (1997). Ecology of Sargassum muticum on the North Coast of Spain II. 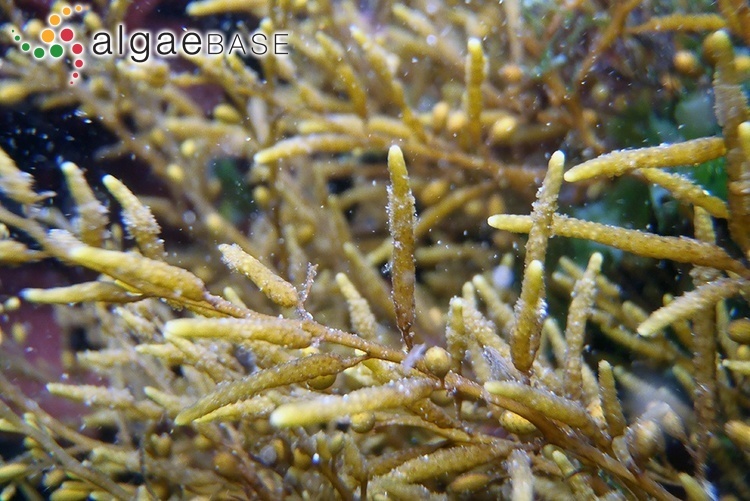 Physiological differences between Sargassum muticum and Cystoseira nodicaulis. Botanica Marina 40: 405-410. Rubin, E., Rodriguez, P., Herrero, R., Cremades, J., Barbara, I. & de Vicente, M.E.S. (2005). Removal of Methylene Blue from aqueous solutions using as biosorbent Sargassum muticum: an invasive macroalga in Europe. Journal of Chemical Technology and Biotechnology 80: 291-298. Rueness, J. (1985). Japweed - Sargassum muticum - Biological pollution of European waters. Blyttia 43: 71-74. Rueness, J. (1989). Sargassum muticum and other introduced Japanese macroalgae: biological pollution of European coasts. Marine Pollution Bulletin 20: 173-176. Sánchez, I. & Fernández, C. (2005). 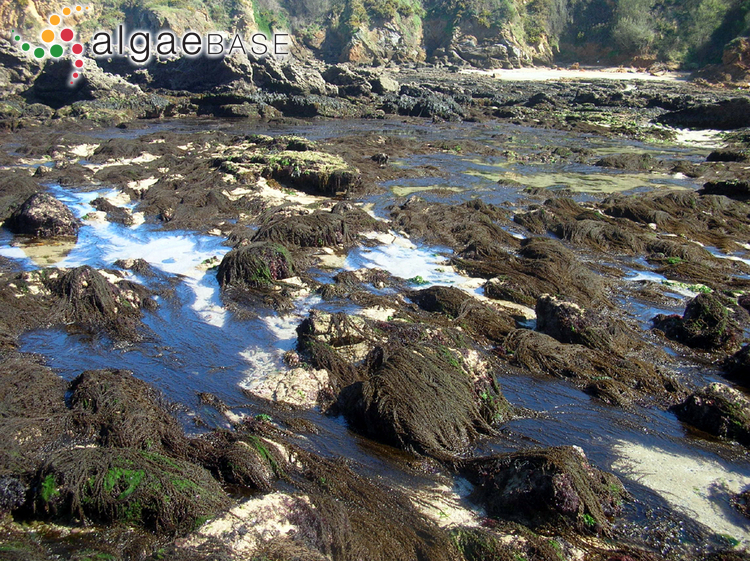 Impact of the invasive seaweed Sargassum muticum (Phaeophyta) on an intertidal macroalgal assemblage. Journal of Phycology 41: 923-930. Sánchez, I.. (2005). Cambios en la estructura de comunidades intermareales motivadas por la invasión de Sargassum muticum. Doctoral Thesis. : Universidad de Oviedo, 131 pp. Scagel, R.F. (1956). Introduction of a Japanese alga, Sargassum muticum, into the northeast Pacific. Fish. Res. Pap., Wash. Dept. Fish. 1: 1-10. Setzer, B. & Link, C. (1971). The wanderings of Sargassum muticum and other relations. Stromatopod 2: 5-6. Simkanin, C.M. (2004). The invasive seaweed Sargassum muticum (Yendo) Fensholt in Lough Hyne Marine Nature Reserve, Co Cork. Irish Naturalists' Journal 27: 481-482. Steen, H. (2003). Intraspecific competition in Sargassum muticum (Phaeophyceae) germlings under various density, nutrient and temperature regimes. Botanica Marina 46: 36-43. Strong, J.A. & Dring, M.J. (2011). Macroalgal competition and invasive success: testing competition in mixed canopies of Sargassum muticum and Saccharina latissima. Botanica Marina 54(3): 223-229. Strong, J.A., Maggs, C.A. & Johnson, M.P. (2009). The extent of grazing release from epiphytism for Sargassum muticum (Phaeophyceae) within the invaded range. Journal of the Marine Biological Association of the United Kingdom 89: 303-314. Tanniou, A., Vandanjon, L., Gonçalves, O., Kervarec, N. & Stiger-Pouvreau, V. (2015). Rapid geographical differentiation of the European spread brown algae Sargassum muticum using HRMAS NMR and Fourier-Transform Infrared spectroscopy. Talanta 132: 451-456. Tanniou, A., Vandanjon, L., Incera, M., Serrano Léon, E., Husa, V., Le Grand, J., Nicolas, J.L., Poupart, N., Kervarec, N., Engelen, A., Walsh, R., Guérard, F., Bourgougnon, N., & Stiger-Pouvreau, V. (2014). Assessment of the spatial variability of phenolic contents and associated bioactivities in the invasive alga Sargassum muticum sampled along its European range from Norway to Portugal. Journal of Applied Phycology 26: 1215-1230. Thomas, E.A. & Tregunna, E.B. (1968). Bicarbonate ion assimilation in photosynthesis by Sargassum muticum. Canadian Journal of Botany 46: 411-415. Tsukidate, J. (1984). Studies on the regenerative ability of the brown algae, Sargassum muticum (Yendo) Fensholt and Sargassum tortile C. Agardh.. Proceedings of the International Seaweed Symposium 11: 393. Viejo, R.M. (1995). La colonización de Sargassum muticum y su efecto sobre las comunidades en la costa asturiana.. Doctoral Thesis. Universidad de Oviedo, 166 pp. Viejo, R.M. (1997). The effects of colonization by Sargassum muticum on tidepool macroalgal assemblages. Journal of the Marine Biological Association of the United Kingdom 77: 325-340. Viejo, R.M., Arrontes, J. & Andrew, N.L. (1995). An experimental evaluation of the effect of wave action on the distribution of Sargassum muticum in Northern Spain. Botanica Marina 38: 437-441, 3 figs, 2 tables. Winder, F. (2002). Sargassum muticum in Kenmare River, Co Kerry. Irish Naturalists' Journal 27: 85. Withers, R.G., Farnham, W.F., Lewey, S., Jephson, N.A., Haythorn, J.M. & Gray, P.W.G. (1975). The epibionts of Sargassum muticum in British waters. Marine Biology, Berlin 31: 79-86. Yamauchi, K. (1984). The formation of Sargassum beds on artificial substrata by transplanting seedlings of S. horneri (Turner) C. Agardh and S. muticum (Yendo) Fensholt. Bulletin of the Japanese Society of Scientific Fisheries 50: 1115-1123.